After a weeklong fishing trip in Yakutat, Alaska, retired Captain David Olson found himself on one of the last flights of the 737-400 combis – a plane he piloted for two years straight when he first started flying for Alaska Airlines nearly 36 years ago. The unique cargo-passenger aircraft will officially retire Oct. 18. A combi is the mullet of airplanes — it’s half cargo in the front and 72 passengers in the back. For decades, it’s served as a lifeline for communities in Alaska that aren’t well connected to the outside world. Eventually, our five combis will be replaced by a fleet of three dedicated 737-700 freighters, one of which is already in service. Each combi flight holds four cargo containers called “igloos” — weighing anywhere from 12,000 to 14,000 pounds. The combi can carry just about anything, including boxes of groceries, bouquets of flowers, brand-new cars or even reindeer. 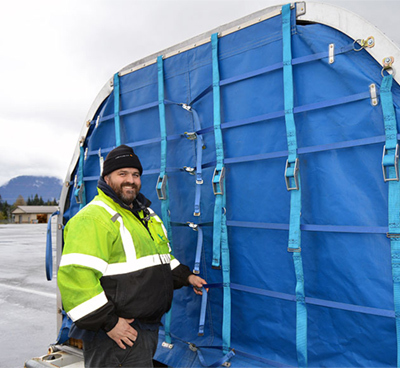 Wayne Coleman, Alaska Airlines lead ramp service agent in Juneau, prepares a cargo igloo for flight. The combi is also used as a way for people get from point A to point B in the nation’s largest state. Getting goods from one city to another in Alaska can be challenging due to its sheer size and rugged terrain. Recently, Sen. Lisa Murkowski of Alaska spoke on the U.S. Senate floor about the important role the combi has played for those who live in her home state. A cargo igloo holds wooden bed frames. On a special route coined “The Milk Run” (it’s literally how people get their milk), Flight 66 flew from Anchorage to Cordova to Yakutat to Juneau earlier this month. Olson’s coolers of freshly caught silver salmon were stored in the front of the plane, and arrived to Seattle in time for them to still have that straight-off-the-boat taste, like they have every time, he said. 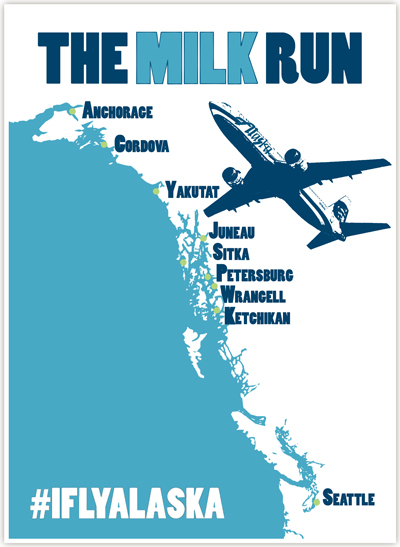 The Milk Run is a daily circuit of Alaska Airlines flights that leave Anchorage and stop about every 45 minutes to deliver goods to towns in Southeast Alaska. From those locations, smaller airplanes usually deliver the cargo and passengers to dozens of nearby villages. Alaska Airlines is the only major airline in the U.S. to have combi planes, so any flight crews that have had the opportunity to work on this plane are now a part of aviation history. After a decade of demanding treks, the five 737-400 combis will be replaced by three dedicated 737-700 freighters. One freighter is already actively in service up in Anchorage and two additional cargo planes are still undergoing the conversion process. All the new freighters are expected to be in service by the end of the year. The combis will likely live out their remaining years as converted freighters with outside parties. The new 737-700 freighters are the first ever to be converted from passenger jet to cargo plane. They will have 20 percent more cargo capacity, and passengers will now fly separately in new Boeing 737s. Late 1940s: A flight attendant helps load cargo into a Douglas DC-3 through the doorway just behind the flight deck. 1948: A BMW Isetta is loaded into a Douglas DC-4. 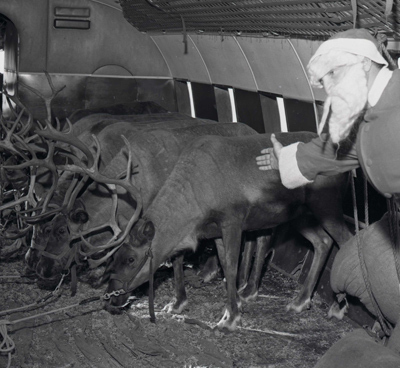 Early 1950s: A cow waits to be transported onto a Douglas DC-4, the “Starliner Matanuska,” at Paine Field. 1950s: A Douglas DC-4 is loaded with cargo. 1964: Charlie Willis, president and first CEO of Alaska Airlines from 1957 to 1972, ordered three Boeing 727-100s. All three jets were C models, built primarily as “combi” aircraft to accommodate passengers and cargo. Early 1970s: Supplies and materials are unloaded from an Alaska 727-100 “Combi” freighter onto a flatbed truck for transport to one of the many pipeline drilling camps in Prudhoe Bay, supporting exploration of oil and gas. In 1981, Alaska Airlines acquired the first of what would eventually become a fleet of nine Boeing 737-200QC combis – the QC stands for “quick change” because it featured a movable partition, which allowed it to add or remove seats based on how much cargo and how many passengers. 1982: A Boeing 737-200C is unloaded as the sun rises at noon in the winter skyline of Kotzebue, Alaska. This combi was capable of carrying cargo as well as up to 111 passengers. Mid 1990s: As the sun sets in a pink glow, an Alaska Airlines Boeing 737-200 crosses the icy taxiway in Nome, Alaska. Alaska Airlines ramp service agents push a freight pallet into position onboard a Boeing 737-200 at SeaTac. Cargo is unloaded from an Alaska Airlines 737-200 in Dutch Harbor, Alaska, with Mount Ballyhoo in the background. 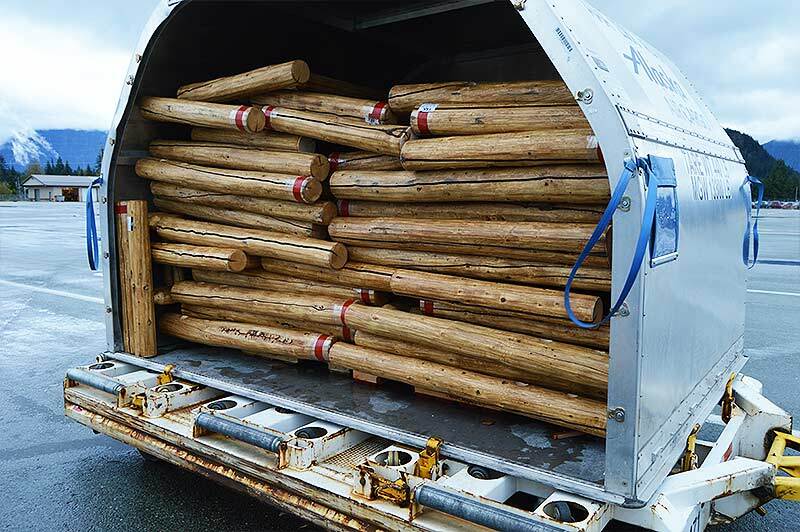 A freight pallet is loaded onboard an Alaska Airlines Boeing 737-200C in Alaska. On a crisp, clear winter day in Anchorage, a pallet of cargo is about to be loaded onto an Alaska Airlines Boeing 737-400C. A special horse stall was created for the 737-200C. This horse is comforted as Alaska Airlines personnel ready its container for loading onboard the Boeing 737-400 freighter in Seattle. Cargo is unloaded and passengers step off a 737-400 combi in Anchorage. Before Boeing combis joined our fleet in 1966, Alaska had a long history of carrying a mix of people and cargo – from cows to cars, and anything else they could fit through the doors of our aircraft. In 1981, Alaska Airlines acquired the first of what would eventually become a fleet of nine Boeing 737-200QC combis – the QC stands for “quick change” because it featured a movable partition, which allowed it to add or remove seats based on how much cargo and how many passengers were onboard. Pilots said they were especially fond of the -200 combi for its sports car-like handling, powerful engines and ability to get in and out of airports with short runways. In the all-freight configuration, the 737-200 combis carried up to six cargo containers. The palletized floor allowed for passenger seating to range from 26 with five cargo pallets to 111 in the all-passenger configuration. Eventually high fuel prices, and increasing maintenance costs and its declining reliability led to its phase-out between 2005 and 2007. The last retired 737-200QC is now at the Alaska Aviation Museum in Anchorage. Alaska replaced its fleet of nine -200 combis with five 737-400 combis and one -400 freighter. After a lengthy retrofitting and certification process, the first -400 combi began service in 2007. Even as the aircraft have changed over the years, Alaska remains dedicated to carrying people and cargo throughout the state of Alaska and beyond. 6 comments on "The end of an era: Alaska retires unique cargo-passenger ‘combi’ planes"
I never thought I would miss flying in them, but now I do. Thanks for the memories. As a retired AS Capt. I flew or worked on all of our combi aircraft, the Connies 727 and the very first combi a convair 340, which we used on the first North Slope operations in 1964. The unique humanitarian need that Alaska Airlines and the 737 ‘combi’ serves is why the airline is my dream carrier to work for. Hate that I will miss the opportunity to pilot one of these classic aircraft on this most important of missions. Long live the 737-400 ‘combi’! Can’t wait for the “Just Planes” retirement video! Awesome that Senator Murkowski spoke about this workhorse of a plane. I never had the opportunity to travel on one, but I appreciate its history. Alaska Airlines has such a rich history. My favorite! I had several trips on these aircraft over the years and never experienced any issues. It was a novel and highly functional design for the Alaska market and I’ll miss flying on these aircraft, that “had first class seating for all!” Happy Trails.